Acquire is a platform where you can also Export your Profiles in a multiple form within a seconds. First of all you need to select the profiles you want to export from the profile section, also you can take a help of filter for the profiles you are targeting. 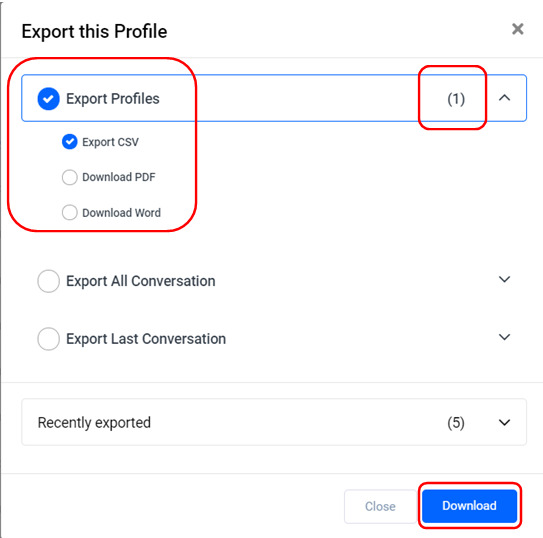 To Export Profile you need to navigate to Profile > Export as per highlighted part. Once clicking on Export button, a pop-up window will be displayed where you can select multiple options according to your requirement. To export the profile section it will includes the basic details from the profile of the Chat. Also, you can export the Profile in different formats like CSV, PDF & word. Select your preferred format to export and just click on Download button on the bottom of the pop-up window. You can see your exported profiles from Profiles > Settings > Manage history > Export. So, from the above path also you can download your profile data in future. 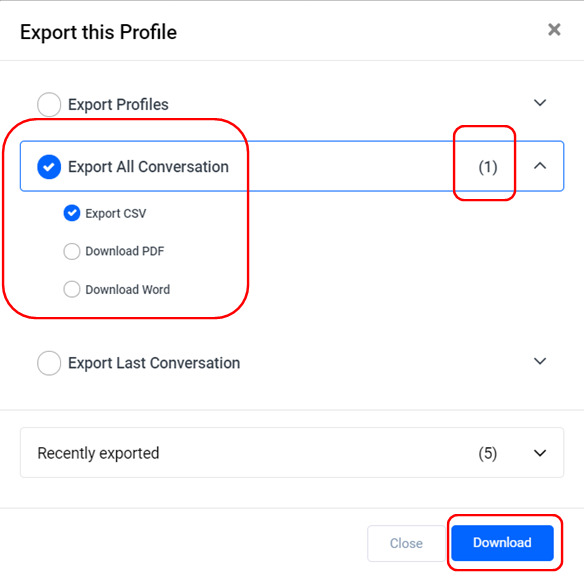 Export conversation will help you to download the chat transcript between the Agent and the customer. You need to follow the same procedure as per Profile. Select the profiles you want conversation from. Also, it will show the number of conversation you are exporting as per highlighted section below. Exported conversation will be saved at Profiles > Settings > Manage history > Export. Also a link to download the Chat history is sent to account email, click on it and you will be redirected to download page.